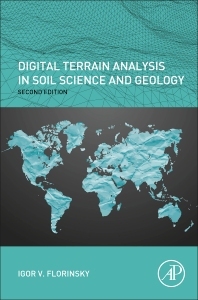 Digital Terrain Analysis in Soil Science and Geology, Second Edition, synthesizes the knowledge on methods and applications of digital terrain analysis and geomorphometry in the context of multi-scale problems in soil science and geology. Divided into three parts, the book first examines main concepts, principles, and methods of digital terrain modeling. It then looks at methods for analysis, modeling, and mapping of spatial distribution of soil properties using digital terrain analysis, before finally considering techniques for recognition, analysis, and interpretation of topographically manifested geological features. Digital Terrain Analysis in Soil Science and Geology, Second Edition, is an updated and revised edition, providing both a theoretical and methodological basis for understanding and applying geographical modeling techniques. Igor Florinsky is a Principal Research Scientist at the Keldysh Institute of Applied Mathematics, Russian Academy of Sciences. He has previously held positions as a Visiting Fellow at the Agriculture and Agri-Food Canada and a Research Scientist at the University of Manitoba in Canada. He is an author, co-author, or editor of over 125 publications including 2 books, 2 edited volumes, 50 papers in peer-reviewed journals, and 13 peer-reviewed book chapters. He is an Editorial Board Member for the journals Chinese Geographical Science, Space and Time, and the International Journal of Ecology and Development. His research interests include digital terrain modeling and geomorphometry, interrelationships between topography, soils, and tectonics, and the influence of the geological environment on humans, society and civilization.